Isabel Haupt and her family were affected by the 7.8 earthquake in Kaikoura, New Zealand, late last year, even though they live over 150 miles away in Wellington. She saw firsthand how residents could be left stranded with nowhere to go. So, Isabel decided to create an app that helps people find a safe place to stay during an evacuation. 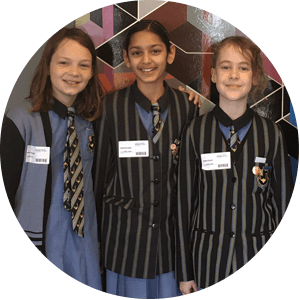 Isabel, and her classmates Eimear Fitzgerald and Jaskiran Rahi, Primary Years Programme (PYP) students at Queen Margaret College created the “Evac-U-Buddy” app prototype—a live, map-based, home finder for tsunami evacuees. 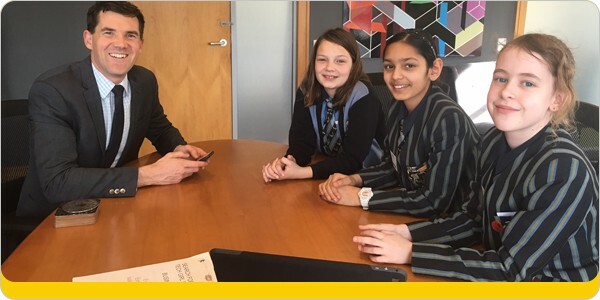 They entered their app into international competition Search for the Next Tech Girl Superhero and won the New Zealand Primary School division. The competition, which aims to give girls the opportunity to get involved in the technology industry, received over a thousand entries this year, making up over 260 teams and products. Explaining how the app works, Eimear says: “You either register as an evacuee or as a host. As a host, you fill in whether your house is dog or baby friendly, and how many people you can take. A pin will pop up on the map so evacuees know how to find you”. Students learned how to code, make a logo and brand name, and devise a business plan. They also gained negotiation, time management and teamwork skills. Isabel says: “We were risk takers and open-minded. It was challenging. I am very excited and proud of our team”. Jaskiran adds: “We had never used the coding app MIT App Inventor 2 before and there was a lot of open-minded learning that happened. We also had to be very reflective, as well as being thinkers as the first solution did not always work”. Since winning the competition, the students have met with the Mayor of Wellington Justin Lester, and are now deciding what’s next for Evac-U-Buddy. There is potential for the app to be developed but it needs more work, says Jaskiran: “We would absolutely love if we could roll this out internationally. This app is just a framework, which can be used for any evacuation process; anywhere from too much traffic, locally, to bushfire evacuations in US, but we need to formulate a database and put security measures in place”.